This tipping guide is valid for all areas in and around Banderas Bay. Employees working in resort towns like Puerto Vallarta literally live on their tips. The minimum wage in Mexico is about $62 pesos per day. That’s equivalent to just over $5 USD per day. Yes. Not $5 per hour, but $5 per day. Workers in Puerto Vallarta are very aware of proper tipping procedures, and they deserve as well as expect to be tipped fairly for the services they provide. These wonderful people work hard to support themselves and their families. With a wide variety of tipping situations encountered during your vacation, how do you know what amount is appropriate for each occasion? Our convenient Puerto Vallarta Tipping Guide will eliminate the uncertainty and help you tip with confidence! Note to readers: This information was updated October 2015 to reflect the dramatic changes in currency exchange rates we’ve experienced over the last few months, as the dollar gets stronger while the Mexican peso weakens. Please keep in mind that a weak peso means a good bargain for tourists, but it also means higher inflation and higher cost of living for the locals, so please adjust your tips accordingly. For example, most toilet paper used in Mexico is actually made in North Carolina, so the devaluation of the peso has resulted in a more than 40% increase in price. U.S. and Canadian coins are completely useless in Mexico. Never leave foreign coins as part of a tip. 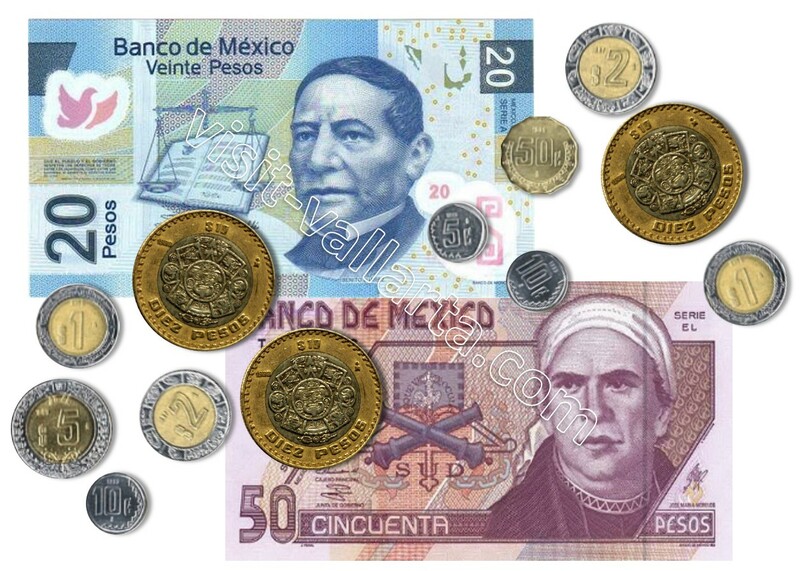 When you tip in US or Canadian dollars the person receiving the tip will need to go to a bank and stand in a very long line to convert the dollars to pesos, and then will of course end up with a lower amount during the conversion process. So again, please tip in pesos. If you run into a situation where you don’t have enough pesos for the tip, then by all means leave the tip in dollars. In this case you may wish to leave a little bit extra to cover the amount of the tip they’ll lose when converting the dollars to pesos at a bank. The workers in the tourist town of Puerto Vallarta count on earnings made during the high season months to last them all year through. The slow season is just that – slow. Some restaurants, depending on their location and flow of tourists within their area, will close up shop from mid-August through October because there are simply not enough customers to keep them open. This also means that many of the area’s wait staff are out of a job during these temporary closures. Tipping guide for Puerto Vallarta, Mexico. Use our advice and tip with confidence! Airport porter: $15 – $30 pesos per bag (or the current equivalent to $1-$2 USD or $1.5-$2.5 CAD). For hotel porters and luggage handlers: $15 – $30 pesos per bag (or the current equivalent to $1-$2 USD or $1.5-$2.5 CAD). Hotel doorman who helps you get a cab: $30 pesos (or the current equivalent to $2 USD or $2.5 CAD). Hotel service waiter: $30 pesos per delivery (or the current equivalent to $2 USD or $2.5 CAD). Condo maid: $75 peso tip (or the current equivalent to $4.50 USD or $6 CAD). + regular cleaning fee for a small condo. The larger the unit and area to clean, the larger the tip. Hotel concierge who performs a service: $45 pesos or more (or the current equivalent to $2.70 USD or $3.50 CAD). Restaurant waiters: 15% – 20% if a service charge is not included on the bill. Bartender: $15 pesos per drink, or 15%-20% of total bill. Spa services: 15%-20% of service price. Tour guides – huge tour group: $75 (or the current equivalent to $4.50 USD or $6 CAD) pesos per person, or $300 pesos (or the current equivalent to $20 USD or $25 CAD) for a family of four. If the experience was exceptional, feel free to leave a larger tip. Tour guides – small personalized tour: $150 pesos (or the current equivalent to $10 USD or $12 CAD) per person. Taxi drivers: It is NOT customary to tip taxi drivers unless they assist you with luggage or groceries ($10 pesos per suitcase) or if you’ve found the driver to be really helpful during the drive by sharing great tourist information, history of the area, etc. Grocery store packers: $15 pesos per transaction, or more if you have a lot of groceries for them to pack. A special government program allows young people and senior citizens to work at grocery stores without compensation in order to bag groceries for tips. They are NOT paid by the grocery store. They work to earn tips. Sand sculpture artists, performers and Papantla Flyers along the Malecon do not receive any wages for their work so they rely on tips. If you appreciate their public works of art and/or performances: $30-$45 pesos (or the current equivalent to $2 – $2.70 USD or $2.5-$3.5 CAD). Musicians performing at restaurants and bars often rely solely on tips! Music should never be thought of as “free.” If you see a tip jar that clearly indicates the musicians are depending on tips. An appropriate tip for a musician: $15 – $30 pesos per customer (or the current equivalent to $1-$2 USD or $1.5-$2.5 CAD). In past years our family has spent numerous vacations at all-inclusive resorts. Although brochures for these resorts will state that tips are included, it’s important to know that the resorts do not put aside a portion of your room fees for tipping their staff. So not only is it general practice to tip appropriately during your stay, it is also highly recommended that guests at all-inclusive resorts do in fact tip. These resort employees work hard to earn a living, and the small amount you’ll be tipping them is nothing that’s going to break the bank! You’re on vacation in paradise. Be generous. Here is our Puerto Vallarta Tipping Guide for all-inclusive resorts. Waiter in Specialty Dining Room (full-service): $150 pesos (or the current equivalent to $10 USD or $12 CAD). No tipping guide would be complete without a word about interacting graciously with beach vendors. First and foremost, be considerate when bargaining with beach vendors. Their job is incredibly hard. Can you imagine walking the entire length of the beach back and forth several times in the burning hot sun carrying a whole load of stuff heaped onto your back and/or in your arms every single day? I know I wouldn’t last 20 minutes doing that! So please consider this when you are bargaining for your goods. Be polite if you don’t wish to purchase anything. A simple “no gracias” is far better than ignoring them altogether. And when you are interesting in negotiating for one or more of their items always strive to be fair. My own personal guideline is the amount I would be willing to pay for the item were I purchasing it in the USA. If I can get it for a little bit cheaper, then wow that’s a real bargain! I’m on vacation and life is good. If there are other tipping situations you would like us to cover in our Puerto Vallarta Tipping Guide, just comment below and let us know!